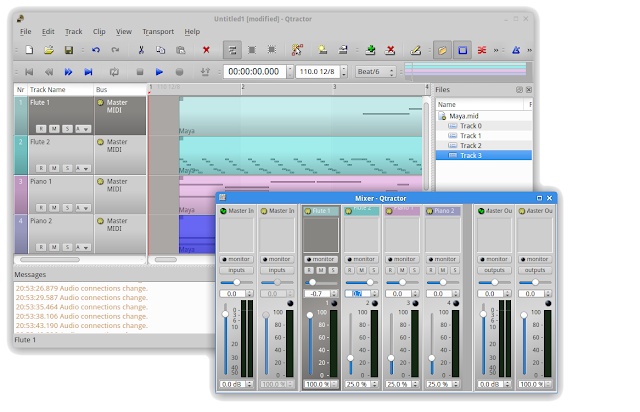 I use Ubuntu Studio (16.04, Xenial Xerus) and a suite of jackd compatible applications. This gives me the flexibility to process and mix anything I want, however, it can be confusing to get going. 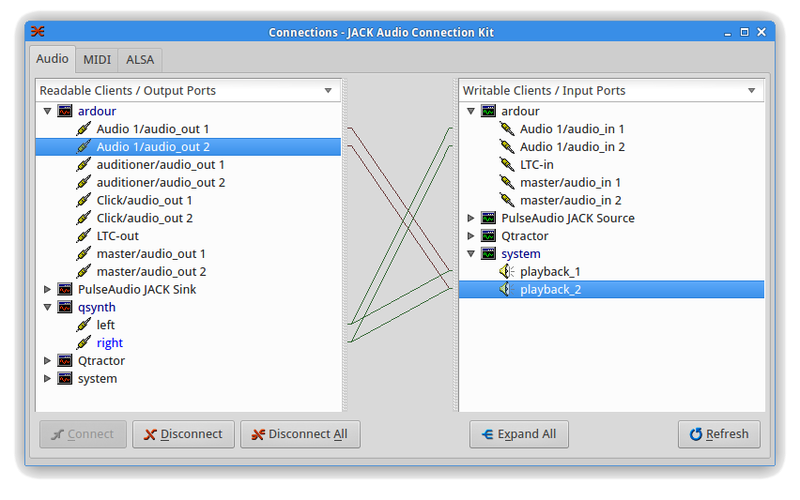 QJackCtl: A front end to the jackd server (which switches and routes all of the MIDI and music messages between applications). QTractor: A MIDI editor and player. 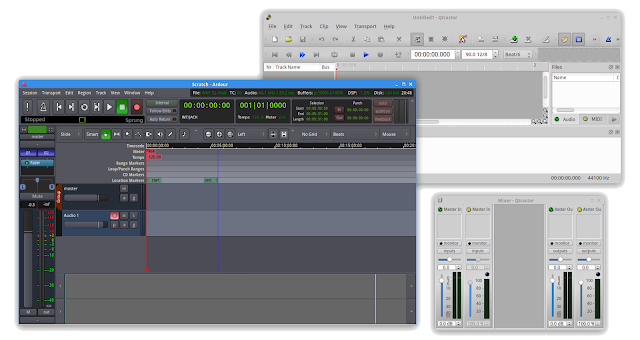 Ardour: A multi-track audio recorder / editor. 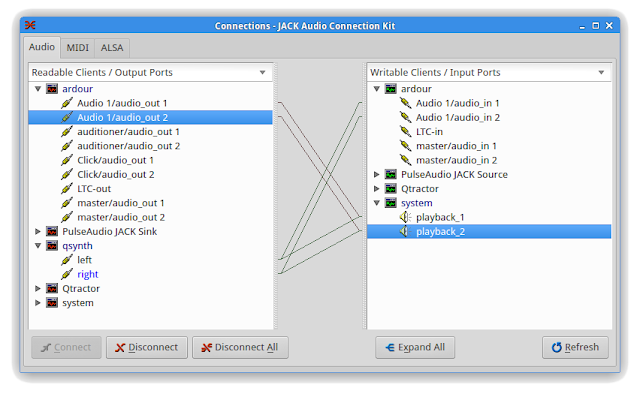 Launch QJackCtl - This will put an application in the systray. Double clicking on the application will show the control window. It should already be running. Launch QSynth, QTractor and Ardour, and in Ardour, Create a Stereo Audio track (we will use this for the recording). 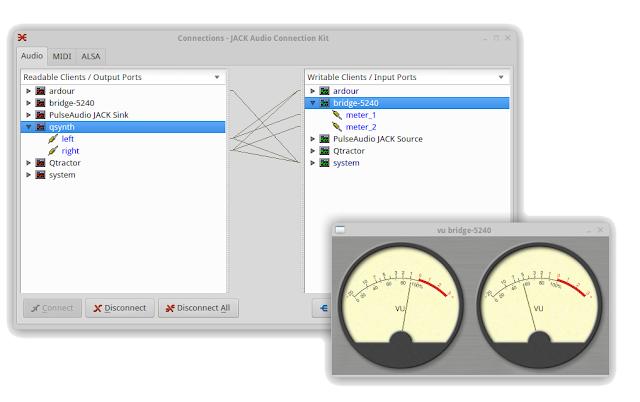 Now the Applications have been Launched, you need to patch them together: In QJackCtl Patch Panel, connect the Midi Out from QTractor to QSynth. 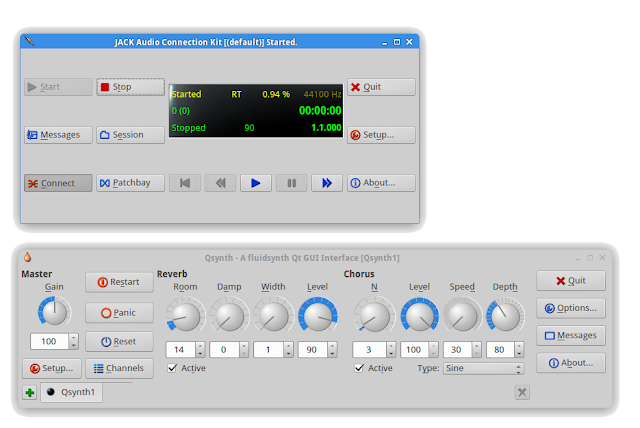 Connect the output of QSynth to the Stereo Audio Track in Ardour, and Connect the Stereo Audio Track in Ardour and QSynth to the Speakers. Load a Midi File into QTractor with Edit/Track/Import/Midi, and you can now adjust the volume of one of the tracks to (say) 25% to quieten it down. Also, you can push the balance (say) 70% to the left and 70% to the right for the two tracks. Push the Midi tracks to the right if you wish a metronome lead-on and enable the metronome. And adjust the tempo of the midi file if required. 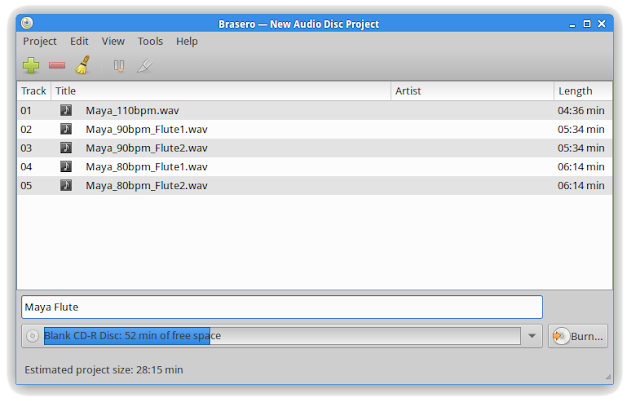 Press Record/Play in Ardour to start recording in Ardour. 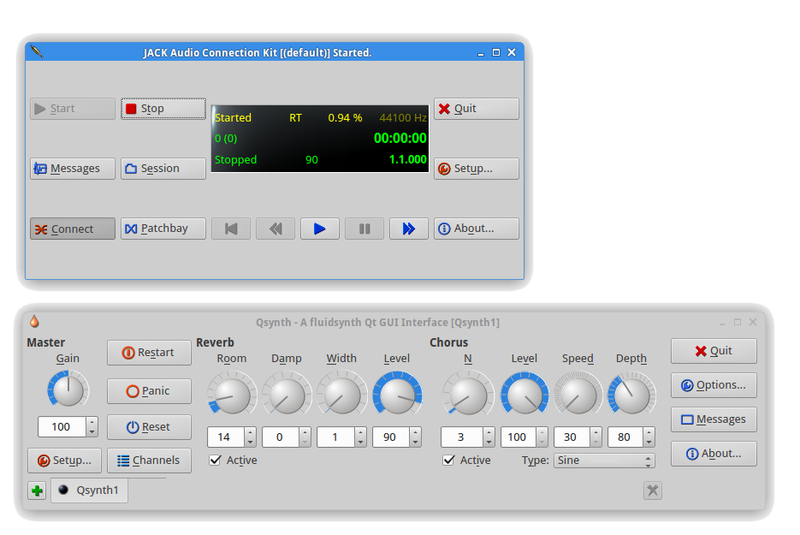 Enable the metronome in QTractor, and then press Play in QTractor, and stop the metronome manually at any point if you wish. Let it play to the end. 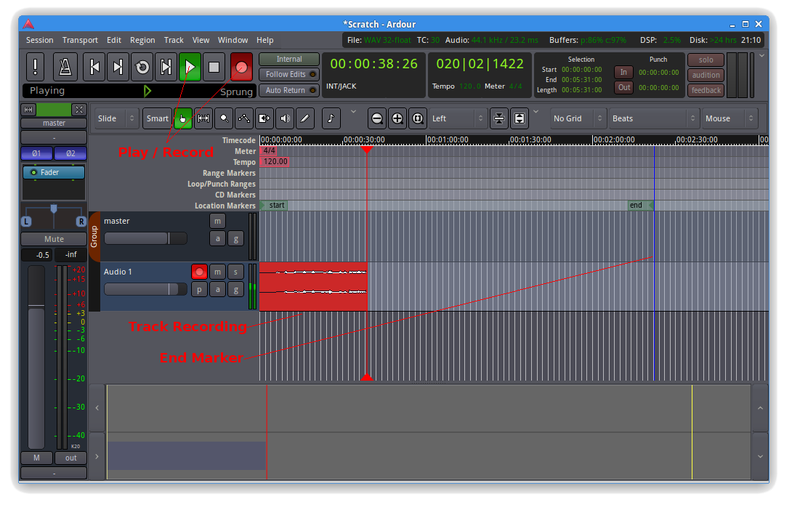 You should then adjust the Start and End Markers to select the part of the audio track you wish to export, then use the Ardour Session/Export export to save to a wav file. 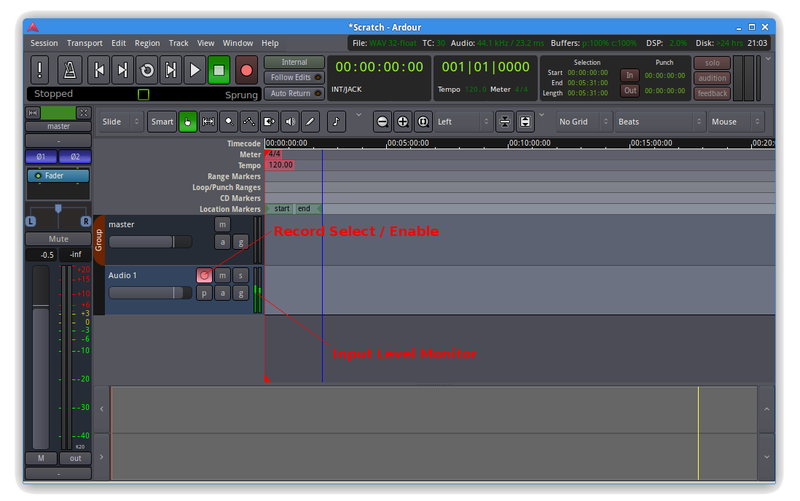 You can now delete the audio recording in Ardour (click and delete), and rewind, adjust the volume balance for the other Flute voice, and record again. Note that the 'end' marker moves to the right with the recording, so you need to keep an eye of where this ends up before any export. And that's it - you will have a number of WAV files that you can burn to CDROM with an application such as Brasero.